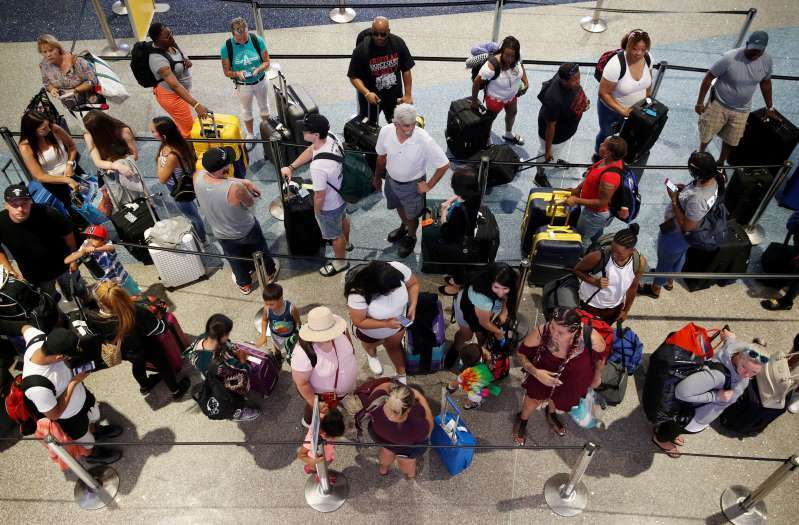 © AP Travelers wait in line June 29, 2018, to check in at McCarran International Airport in Las Vegas. The Transportation Security Administration will keep its checkpoints at 150 smaller airports, despite studying possibly eliminating them to save money, the head of the agency said Wednesday. TSA Administrator David Pekoske told USA TODAY’s editorial board that the agency studied the idea of closing checkpoints as merely a budget exercise, but that the risks didn't outweigh the potential benefits. “We’re not doing that. Real simple," Pekoske said. “We looked at that and decided that was not an issue worth pursuing. Off the table." CNN revealed the study Aug. 1, igniting a firestorm of criticism. [post_ads]The idea, which studied since 201, explained that TSA could drop federal staffing at airports with planes seating up to 60 passengers and save $115 million per year. Those airports serve about 10,000 passengers per day and require nearly 1,300 TSA workers, who could be shifted to larger airports. But airport officials and security experts worried about risks of no screening. Passengers would have to be screened when connecting at larger airports, which would require airports and airlines to reconfigure terminals. Jeff Price, an aviation security expert and professor at the Metropolitan State University of Denver, said the burden would fall on larger airport operators. A lone terrorist could also attempt to hijack a 60-seat plane from a smaller airport to mount an attack on a smaller scale than Sept. 11, he warned. And some lawmakers said Congress should provide TSA with all of the security fees from airline tickets. Rep. Bennie Thompson of Mississippi, the top Democrat on the Homeland Security Committee, said rather than dropping service, Congress should issue all the funding that TSA ticket fees generate because $1.3 billion is diverted each year to help reduce the budget. Pekoske said the possible benefits didn't offset the risks of the change. “Part of what any federal agency does over the course of a given year is we look at gaps we need to cover, because our budget process is moving, and where can we find efficiencies," Pekoske said. “We looked at it and said the benefits that it would present are not worth the risks it would introduce and we just decided not to pursue."